The Diamond Princess is getting a big-time makeover. To get ready for its second season of Japan cruising, the Princess Cruises ship is undergoing an extensive drydock through April 2 to add enticing new features designed to appeal to Japanese cruisers. During the $30 million-dollar refurbishment, the ship will receive an extensive new Japanese bath area – making it the largest such bath experience at sea – as well as a new sushi restaurant, enhanced shopping areas, a revitalized Horizon Court, additional staterooms, new interior furnishings and finishes, fresh hull paint and exterior refurbishment, and contemporary and Asian-style touches. The drydock, which begins today, will take place through April 2, 2014 at Sembawang shipyard in Singapore. Interested viewers can follow the drydock progress with regular photo updates offering a behind-the-scenes glimpse each day. Passengers will step into the new bath area through a peaceful entrance beckoning them toward an elegant, open-air Japanese unisex hydro-therapy pool, which is surrounded by refreshing ocean breezes. Outdoors, passengers will be able to relax in plush shaded lounge chairs or soak in a footbath while enjoying fresh salt air. Indoors, passengers can enjoy two separate, gender-segregated bath experiences with spectacular sea views. The ocean-view sauna and bath will feature an open air skylight to help bathers connect with nature, as well as a dry sauna with dramatic floor-to-ceiling windows, plus a refreshing gentle mist sauna. The Stone Bath will feature an Utaseyu, an invigorating cascade of hot water that is ideal for relieving tension in the back and shoulders. The duty-free boutiques aboard Diamond Princess will be remodeled to offer a new luxury shopping experience to appeal to customers in Japan. Among the distinctive new spaces is a luxury watch boutique -- anchored by a special Omega shop. The Essence boutique will introduce the first fragrance bar at sea where passengers can sample and learn about new scents. The Meridian Bay boutique includes a full crystal Swarovski installation as well as Jacqueline Kennedy and Audrey Hepburn collections. A new Limelight luxury boutique will offer designer leather and accessories including fashionable international and American designer brands such as Burberry, Fendi, Salvatore Ferragamo, Coach and Ralph Lauren. Once out of drydock, Diamond Princess will set sail on a season of Japan-based cruises on April 17. The ship will homeport in Tokyo (Yokohama) for an extended season of nine-day cruises that include visits to Taiwan, South Korea, Hokkaido, Russia and 15 Japanese ports, including five new itineraries created especially for the ship. 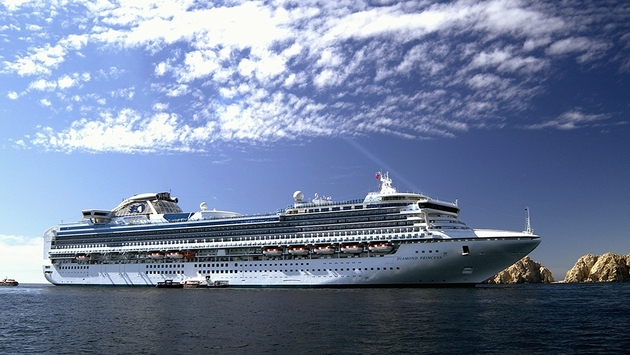 During the popular holiday period of Golden Week, Diamond Princess will feature a special 10-day itinerary that includes opportunities to visit several festivals plus enjoy a special call to Nagasaki, home to Mitsubishi Heavy Industries where the ship was built, to celebrate Diamond Princess’ 10-year anniversary.